Make the pudding according the package directions and place in the refrigerator to thicken. Grease two ramekin dishes. Make circles from the pie crust that are large enough to cover the bottom and sides of two ramekins, then tuck the crust into them. Use a biscuit cutter to make two circles large enough to cover the top of the ramekins; set those aside for now. Cut orange Starburst candies into tiny squares for the carrots. Warm a yellow Starburst in the microwave a couple seconds until it's pliable, then roll it into small balls to resemble corn kernels. Knead green food coloring and some leftover pie dough together until coloring is well integrated, then make small balls for peas. Cut fruit snacks into bits to resemble chunks of squash or other vegetables. The different candy type adds some texture and color to the pie. Once the pudding has set, add a few scoops into the pie crust-filled ramekin. Then top with the candy veggies. Place the smaller pie dough circle on top and pinch the edges together to enclose the pudding and candy. Use a fork to crimp the edges to seal completely and give it a realistic pot pie look. Brush the top crust with a whisked egg yolk so when the crust bakes it will have a nice golden color. Bake in a preheated 450°F oven for 10 minutes or until the crust is golden brown. Let pies cool in the refrigerator so the pudding can set again before serving. Serve up some pot pies for April Fools' Day! Surprise! These are actually dessert, with pudding and candies! Mmm ... the smell of fresh mini pot pies is in the air. With just once glance, you can almost taste the moist chicken and savory sauce that you're about to indulge in. Then as you take that ?rst bite ... RECORD SCRATCH! These aren't mini pot pies made from scratch – they're a fun and delicious dessert! 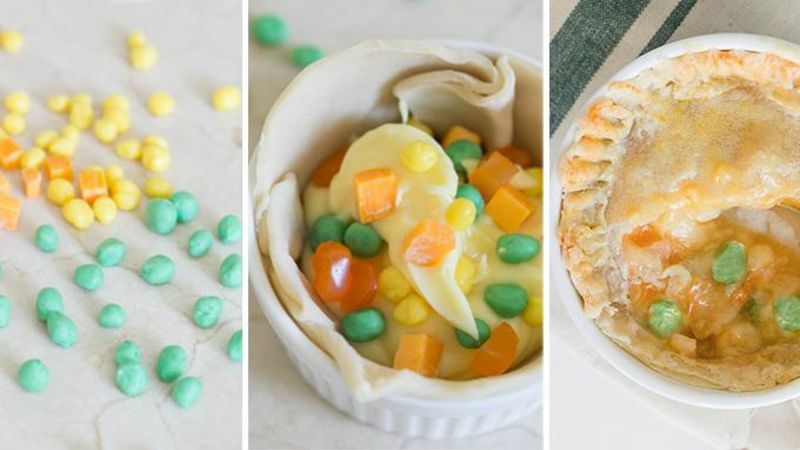 Get in on April Fools' Day and make these hilarious, yet super tasty, faux mini pot pies. What a great prank!